The 2010 Broadway Cast Recording of the original new musical SONDHEIM ON SONDHEIM, has received a Grammy Award nomination for Best Musical Show Album. The two-disc set was produced by PS Classics co-founder, Tommy Krasker, who has twelve Sondheim cast albums to his credit. The 53rd Annual Grammy Awards will be announced on CBS on February 13, 2011. SONDHEIM ON SONDHEIM featured the legendary vocal talents of Barbara Cook, Vanessa Williams & Tom Wopat and also featured Broadway favorites Leslie Kritzer, Norm Lewis, Euan Morton, Erin Mackey & Matthew Scott. Music & lyrics are by Stephen Sondheim and the production was conceived & directed by James Lapine. Roundabout Theatre Company’s SONDHEIM ON SONDHEIM played on Broadway from March 19th, 2010 and opened officially on April 22nd, 2010 at Studio 54. The limited engagement was extended due to popular demand and closed on June 27th, 2010. Roundabout Theatre Company’s (Todd Haimes, Artistic Director) limited engagement of Sondheim on Sondheim will play its final performance on Sunday, June 27th at 2:00 PM. This new Broadway musical stars Barbara Cook, Vanessa Williams, Tom Wopat, Leslie Kritzer, Norm Lewis, Euan Morton, Erin Mackey & Matthew Scott. Music & lyrics are by Stephen Sondheim and the production is conceived & directed by James Lapine. “Sondheim is the best, brightest & most influential talent to emerge during the last half-century. PS Classics, the label dedicated to the heritage of Broadway and American popular song, will record the original Broadway cast album of SONDHEIM ON SONDHEIM on June 6th and 7th. The production, presented by Roundabout Theatre Company (Todd Haimes, Artistic Director), began performances at Studio 54 on March 19th, opened officially on April 22nd and recently announced a two-week extension through June 27th. SONDHEIM ON SONDHEIM stars Barbara Cook, Vanessa Williams, Tom Wopat, Leslie Kritzer, Norm Lewis, Euan Morton, Erin Mackey & Matthew Scott. The production is conceived & directed by James Lapine, with music & lyrics by Stephen Sondheim. The two-disc set will be produced by PS Classics co-founder, Tommy Krasker, who has twelve Sondheim cast albums to his credit, including the current Broadway production of A Little Night Music, and Roundabout Theatre Company’s productions of Assassins and Pacific Overtures. PS Classics co-founder Philip Chaffin, and Alan D. Marks and Stephen Moore, of The Marks-Moore Group, will serve as Executive Producers. The album is currently available for pre-orders at www.psclassics.com. The 55th annual Drama Desk Awards, celebrating excellence in Broadway, Off-Broadway and Off-Off Broadway theatre, were presented last night. BRIGHTON BEACH MEMOIRS won Outstanding Featured Actor in a Play (Santino Fontana). FENCES won Outstanding Revival of a Play, Outstanding Featured Actress in a Play (Viola Davis) & Outstanding Music in a Play (Branford Marsalis). LA CAGE AUX FOLLES won Outstanding Revival of a Musical, Outstanding Actor in a Musical (Douglas Hodge) and Outstanding Costume Design (Matthew Wright). A LITTLE NIGHT MUSIC’s Catherine Zeta-Jones won Outstanding Actress in a Musical. A special award was presented to the cast, creative team and producers of THE ORPHANS’ HOME CYCLE as the theatrical event of the season. RAGTIME won Outstanding Sound Design in a Musical (ACME Sound Partners). RED won Outstanding Play (John Logan), Outstanding Director of a Play (Michael Grandage) and Outstanding Lighting (Neil Austin). MANHATTAN THEATRE CLUB’S THE ROYAL FAMILY won Outstanding Actress in a Play (Jan Maxwell). THE SCOTTSBORO BOYS won Outstanding Lyrics (John Kander, Fred Ebb). ROUNDABOUT THEATRE COMPANY’S SONDHEIM ON SONDHEIM won Outstanding Musical Revue. A VIEW FROM THE BRIDGE won Outstanding Revival of a Play and Outstanding Actor in a Play (Liev Schreiber). A special award was presented to Jerry Herman. Winners of the 76th annual Drama League Awards were announced this afternoon. Roundabout Theatre Company’s Sondheim on Sondheim received the Award for Distinguished Production of A Musical. 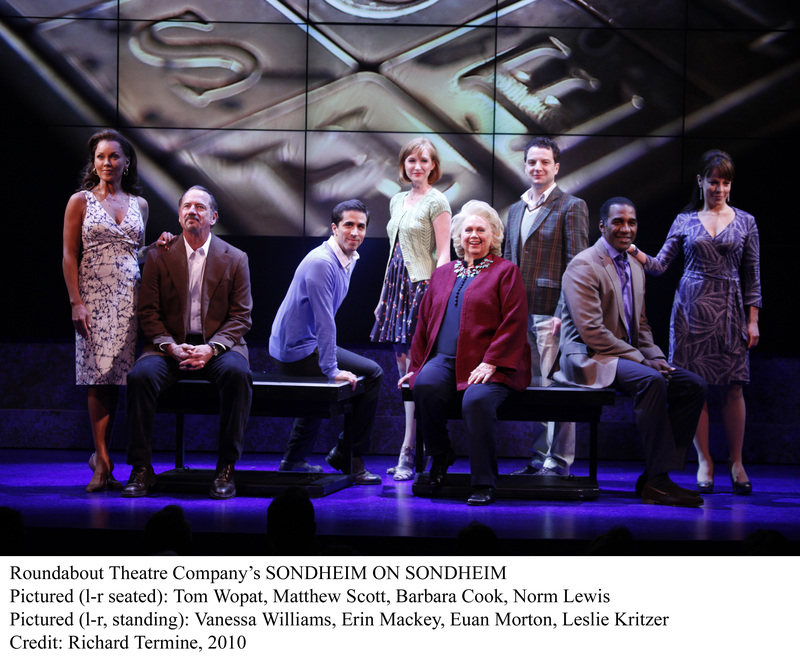 Roundabout Theatre Company’s Broadway production of Sondheim on Sondheim stars Barbara Cook, Vanessa Williams, Tom Wopat, Leslie Kritzer, Norm Lewis, Euan Morton, Erin Mackey & Matthew Scott. Music & lyrics are by Stephen Sondheim and the production is conceived & directed by James Lapine. Sondheim on Sondheim is playing at Studio 54 on Broadway (254 West 54th Street). This limited engagement has been extended through Sunday, June 27th, 2010. 1958 Tony Award for Best Featured Actress in a Musical (The Music Man), 1987 Drama Desk Award for Outstanding One Person Show (Barbara Cook: A Concert for the Theatre), 2003 Drama Desk nomination for Outstanding Solo Performance (Mostly Sondheim), 2004 Drama Desk nomination for Outstanding Solo Performance (Barbara Cook’s Broadway!) and a 1955 Theatre World Award for Plain and Fancy. Barbara Cook’s association with Stephen Sondheim began in 1985 when she starred as Sally in the NY Philharmonic’s now legendary concerts of Follies and continued with her Tony Award nominated concert Mostly Sondheim. As a leading star on Broadway during the 50’s and 60’s, her many credits include the creation of three classic roles in the musical theatre: Cunegonde in Candide, Marian in The Music Man (Tony Award) and Amalia in She Loves Me (Drama Desk Award). In 1974, Ms. Cook embarked on a concert and recording career, achieving one career high after another from her solo concert debut at Carnegie Hall in 1975 to her historic solo concert at the MET in 2006 when she became the first female non-classical singer to be presented by the Metropolitan Opera in that company’s long history. The most recent of the many recordings by this Grammy Award winner is the 6-cd boxed set The Essential Barbara Cook. (DRG Records). Tune in to “The Late Show with David Letterman” (CBS) to hear a performance by Best Musical Tony nominee, Million Dollar Quartet, and to see guest Sam Rockwell from A Behanding in Spokane. “The Late Show” airs on WCBS TV/Channel 2 in New York at 11:35 PM. Check local listings. Tune in to “Live! with Regis & Kelly” (ABC) to see Lucy Liu, star of the Tony Award-winning Best Play, God of Carnage. “Live” airs in the New York area on WABC-TV/Channel 7 at 9:00am. Check local listings. Tune in to “LX-TV” (WNBC) to see double Tony Nominee Jan Maxwell from Lend Me a Tenor and The Royal Family. “LX” airs on WNBC TV/Channel 4 at 5 PM in New York. Tune in to “The View” (ABC) to see Sondheim on Sondheim’s Vanessa Williams co-host, and perform with her Broadway co-star Barbara Cook. “The View” airs on WABC-TV/Channel 7 in New York at 11 AM. Check local listings. Tune in to “Good Morning America” (ABC) to see La Cage aux Folles’ Kelsey Grammer, Douglas Hodge and the Cagelles between 8:30 – 9:00 AM. Tune into “Theatre Talk” (WNET) to see Christopher Walken, star of A Behanding in Spokane. “ Theatre Talk” airs on WNET-TV/ Channel 13 at 12:30 AM in New York.